Is Beet, Tomato & Celery Juice Good for You? When you walk down the grocery aisles, you see dozens of juice choices geared toward children, but not all of them are healthy choices. As a parent, read the nutrition labels and the list of ingredients of juices you buy to ensure that you are making wise choices for your child. Before you consider which juice your child should drink, know that water is the most important liquid in your child's diet. Water has no substitute and you should consider it to be your child's primary daily beverage. Depending on your child's activity level, height, weight, and geographical region, the exact amount of water your child needs each day can vary, but when your child is thirsty, give him water. Children ages 4 to 8 need around 4 to 6 cups of water a day. Ages 9 and up need about 8 cups a day, and sometimes more, depending on how active he is or on genetics. Not many in the nutrition world would deny that 100-percent pure fruit or vegetable juice is good for the body, but there are limits as to how much to give to children. Don't give juice to any child younger than 6 months, recommends the American Academy of Pediatrics. Children age 1 to 6 years should consume up to 4 to 6 ounces a day. Children ages 7 to 18 can have 8 to 12 ounces of juice per day. Every parent knows that getting your child to eat his vegetables can be a challenge. This is where juicing is beneficial. Try not to use juiced vegetables as a meal replacement, but as a portion replacement. Vegetables offer many necessary vitamins and minerals, and packing them into a juice concoction is sometimes your best bet. 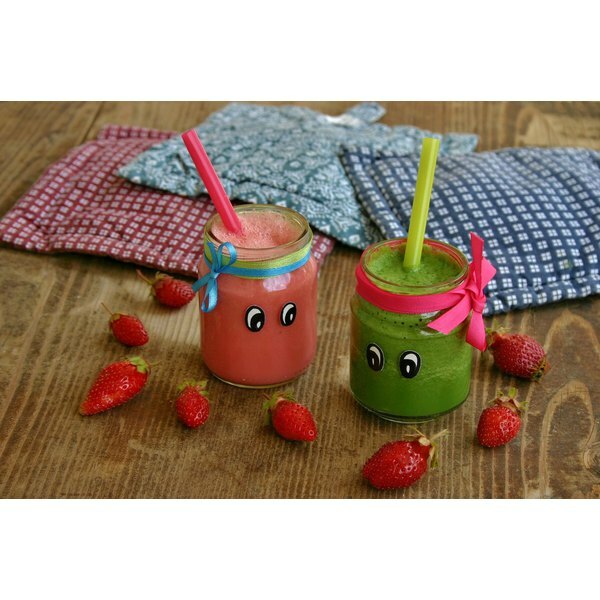 Bright juice colors can also entice children to drink more. Three carrots, 1 peeled orange, and 1 apple gets you about an 8-ounce serving that has more than 100 percent of your daily vitamin A, about 90 percent of vitamin C, and a healthy start to many other vitamins that your child needs throughout the day. A 2007 article in “Pediatrics” relayed that obesity is linked to beverages, including highly processed, sweetened fruit juices, but that 100-percent fruit juice is not related to obesity unless consumed in large quantities. Read the juice package labels to ensure that you are buying 100-percent fruit juice without any added sugar or syrups. Even though 100-percent juices are a better choice than sweetened fruit juices, 8.45 ounces of 100-percent apple or orange juice can have around 25 grams of sugar. These juices do provide healthy antioxidants and vitamins that your child needs, but limit these juices to 1 serving a day. Adam Scott is a nutrition-minded father and husband. Currently he is pursuing a master's in nutrition and food studies at a major East Coast University. Soon he will be a Registered Dietitian and continue teaching proper nutrition. His work has been seen in many major newspapers. Should I Juice if I Am on a Low-Carb Diet?